Testicular cancer is seriously threaten to men's health, the harm of which is mainly embodied in male's infertility. The key of testicular cancer treatment is to live up to early detection and early treatment. Early treatment has a certain good effect on the rehabilitation of patients while it will become very difficult to be treated once the cancer develop into advanced stage. Understanding the diagnostic methods of testicular cancer will contribute to the treatment to a great extent. What are the diagnoses of testicular cancer? 1、Laboratory diagnoses: Laboratory diagnoses mainly contain the test of β -HCG, AFP and LDH serum, and these serum tumor markers have important significance to the treatment, follow-up and prognosis of testicular cancer. 2、Imaging diagnosis: As the most preferred diagnostic method clinically, type B ultrasound can help to identify the mass in the scrotum. Abdominal and pelvic CT is applied to confirm lymph node metastasis, while chest radiograph and CT is used to judge lung metastasis. Therefore, abdominal and pelvic CT is an important basis for the staging of testicular cancer patients. In the follow-ups of testicular cancer patients, positron emission tomography ( PET ) has a very high sensitivity and specificity on the evaluation of residual cancer cells. 3、Pathologic diagnosis: Biopsy may be a definitive diagnosis to testicular tumor, but there is certain risk of implanted metastasis. Thus, scrotal testis puncture biopsy should be applied with caution. In addition, differential diagnosis is also one of testicular cancer diagnoses which includes the diagnosis of testicular epidermoid or dermoid cyst, testicular torsion, epididymitis, epididymo orchitis, and hydrocele. 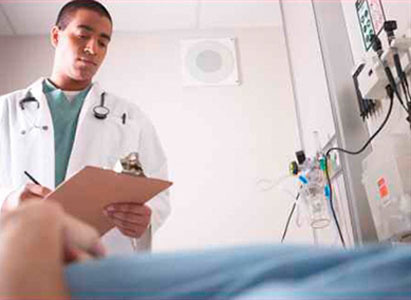 Experts from Modern Cancer Hospital Guangzhou remind that if one is diagnosed with testicular cancer after related examinations, he should go to regular hospitals for treatment promptly.